(Vatican Radio) Pope Francis on Thursday expressed his gratitude to the nation of Bangladesh for providing assistance and shelter to the hundreds of thousands of refugees pouring into the country, he appealed to the international community to address the crisis both on a political and on a material level, and he warned against using God’s name to justify hatred and violence against our fellow human beings. The Pope’s words came during his address to political leaders, civil society and the diplomatic corps at the President House in Dhaka. At the beginning of my stay in Bangladesh, I would like to thank you, Mr President, for the kind invitation to visit this country and for your gracious words of welcome. I come here in the footsteps of two of my predecessors, Pope Paul VI and Pope John Paul II, to pray with my Catholic brothers and sisters, and to offer them a message of affection and encouragement. Bangladesh is a young state, yet it has always had a special place in the heart of the Popes, who from the start have expressed solidarity with its people, sought to accompany them in overcoming initial adversities, and supported them in the demanding task of nationbuilding and development. I am grateful for the opportunity to address this assembly, which brings together men and women with particular responsibilities for shaping the future of Bangladeshi society. During my flight here, I was reminded that Bangladesh – “Golden Bengal” – is a country united by a vast network of rivers and waterways, great and small. That natural beauty is, I think, symbolic of your particular identity as a people. Bangladesh is a nation that strives to join unity of language and culture with respect for the different traditions and communities which, like so many streams, draw from, and return to enrich, the great current of the political and social life of the country. In today’s world, no single community, nation or state can survive and make progress in isolation. As members of the one human family, we need one another and are dependent on one another. President Sheikh Mujibur Rahman understood and sought to embody this principle in the national Constitution. He envisioned a modern, pluralistic and inclusive society in which every person and community could live in freedom, peace and security, with respect for the innate dignity and equal rights of all. The future of this young democracy and the health of its political life are essentially linked to fidelity to that founding vision. For only through sincere dialogue and respect for legitimate diversity can a people reconcile divisions, overcome unilateral perspectives, and recognize the validity of differing viewpoints. Because true dialogue looks to the future, it builds unity in the service of the common good and is concerned for the needs of all citizens, especially the poor, the underprivileged and those who have no voice. In recent months, the spirit of generosity and solidarity which is a distinguishing mark of Bangladeshi society has been seen most vividly in its humanitarian outreach to a massive influx of refugees from Rakhine State, providing them with temporary shelter and the basic necessities of life. This has been done at no little sacrifice. It has also been done before the eyes of the whole world. None of us can fail to be aware of the gravity of the situation, the immense toll of human suffering involved, and the precarious living conditions of so many of our brothers and sisters, a majority of whom are women and children, crowded in the refugee camps. It is imperative that the international community take decisive measures to address this grave crisis, not only by working to resolve the political issues that have led to the mass displacement of people, but also by offering immediate material assistance to Bangladesh in its effort to respond effectively to urgent human needs. Although my visit is primarily addressed to Bangladesh’s Catholic community, a privileged moment will be my meeting tomorrowin Ramna with ecumenical and interreligious leaders. Together we will pray for peace and reaffirm our commitment to work for peace. Bangladesh is known for the harmony that has traditionally existed between followers of the various religions. This atmosphere of mutual respect, and a growing climate of interreligious dialogue, enables believers to express freely their deepest convictions about the meaning and purpose of life. In this way, they can contribute to promoting the spiritual values that are the sure basis for a just and peaceful society. In a world where religion is often – scandalously – misused to foment division, such a witness to its reconciling and unifying power is all the more necessary. This was seen in a particularly eloquent way in the common reaction of indignation that followed last year’s brutal terrorist attack here in Dhaka, and in the clear message sent by the nation’s religious authorities that the most holy name of God can never be invoked to justify hatred and violence against our fellow human beings. 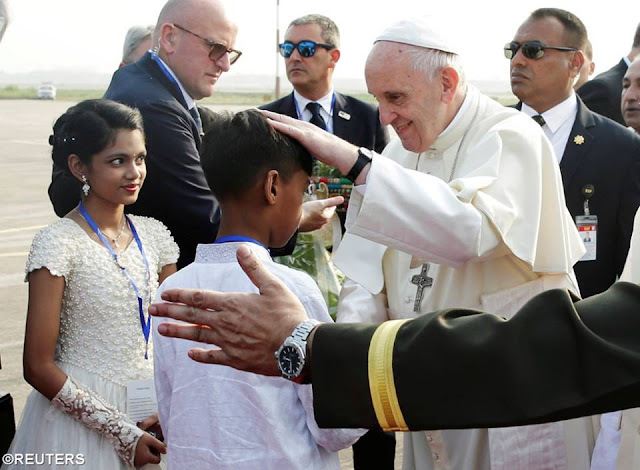 Bangladesh’s Catholics, though relatively few in number, nonetheless seek to play a constructive role in the development of the country, particularly through their schools, clinics and dispensaries. The Church appreciates the freedom to practice her faith and to pursue her charitable works, which benefit the entire nation, not least by providing young people, who represent the future of society, with a quality education and a training in sound ethical and human values. In her schools, the Church seeks to promote a culture of encounter that will enable students to take up their responsibilities in the life of society. Indeed, the vast majority of the students and many of the teachers in these schools are not Christians, but from other religious traditions. I am confident that, in accordance with the letter and the spirit of the national Constitution, the Catholic community will continue to enjoy the freedom to carry out these good works as an expression of its commitment to the common good. I thank you for your attention and I assure you of my prayers that in your lofty responsibilities, you will always be inspired by the high ideals of justice and service to your fellow citizens. Upon you, and upon all the people of Bangladesh, I willingly invoke the Almighty’s blessings of harmony and peace.